Amsterdammer Somaye Dehban remembers Amsterdam’s mayor Eberhard van der Laan and the impact he has had on her life and family. I am an Amsterdammer who was truly affected by the news of your illness like many others, even the ones who have met you for a brief moment. I am writing you this letter because I want you to know how grateful and appreciative I am for what you have done for me and my family – specifically my younger son. You probably don’t remember shaking the little hand of my younger son (about 1.5 year old at the time) while he was in my arms. You, Mr Mayor, pronounced us both Dutch nationals in 2015. I couldn’t hold back my tears when you called up our names and when I testified on our behalf that we would be loyal citizens to the Netherlands: I cannot hold back my tears while writing you this letter either. You have had many of these ceremonies during your career as Amsterdam’s mayor so this handshake will have been like many others you have had. Yet our backstory and ‘our’ moment with you, shows the importance of your trust in ‘us’ as the newly pronounced nationals. Up until that hand-shake moment, my younger son did not have a nationality; in other words, as was mentioned on his ID card, he was ‘stateless’. I am originally from a country where, as a woman, I do not have the right to pass on my nationality to my children. Their biological father decided not to recognise our younger child so my second son could not receive a nationality from either of us. So, after my son’s birth, I decided to apply to become a Dutch national and by the power of the Dutch constitution I could pass on my Dutch nationality to him. 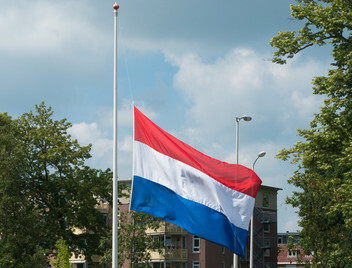 For our family – me, my older son (who is Dutch from birth) and my younger son – that moment in which you pronounced us as Dutch nationals was not only an integration moment but also a unifying instance: in that moment, we all ‘became’ Dutch. For me in particular this was an empowering experience: to pass on a right to my son, as a woman, an experience and a right that I have been denied of my whole life. On that day you also gave my son a book which was his first gift as a Dutch national: Van Mug tot Olifant – every now and then, we sit together and read this book. The book does not have much text but a lot of illustrations which we explore in our imaginations. The book is a clever look at the diversity in the animal kingdom and how each member of this family has a role and duties within the community. You picked a very smart gift for the ones whom you pronounced as the new young Dutch nationals. Dear Mr van der Laan, for our family you were more than a mayor. For us, you were a public servant, an individual, who believed in the added value that we – the newcomers – offer Dutch society.